Washington - A landmark nuclear deal with Tehran moved closer to implementation Monday, with U.S. Secretary of State John Kerry announcing that tons of enriched uranium that could potentially be turned to use in atomic arms were on a ship heading from Iran to Russia. Kerry hailed the development as “one of the most significant steps Iran has taken toward fulfilling its commitments” under the July 14 nuclear agreement, in comments that expanded on information The Associated Press received from a senior Russian diplomat earlier in the day. That envoy, who spoke on condition of anonymity because he wasn’t authorized to be cited by name, said Iran had permitted Russia to take possession of and ship out most of its low-enriched uranium. Low-enriched uranium is suitable primarily to generate nuclear power and needs substantial further enrichment for use in the core of a nuclear warhead. But Kerry said that the shipment also included the remaining stock of Iranian uranium that already had been enriched to higher levels, just a technical step away from what is needed to form the fissile core of a nuclear bomb. The July 14 deal aims to reduce Iran’s ability to make nuclear weapons — something Tehran says it has no interest in. Under the agreement, Iran committed to shipping out all except 300 kilograms (about 650 pounds) of its low-enriched uranium and to either export the uranium it has that is enriched to near 20 percent, process it into low-enriched uranium or turn it into fuel plates to power a research reactor. Kerry indicated both steps were completed Monday, announcing that more than 25,000 pounds (12.5 tons) of enriched “uranium materials” were in the hold of a Russian ship steaming toward Russia. He said the shipment included the near-20 percent enriched uranium that had not yet been turned into fuel plates. The July agreement also commits Iran to sharply reduce the number of its centrifuges, which are used to enrich uranium, as well as to re-engineer a reactor to cut its output of plutonium — another pathway to nuclear weapons. The U.N.‘s International Atomic Energy Agency, which is monitoring the progress of the Iranian implementation, says both of those measures are well underway. The Russia-Iran accord under the July deal foresees that Moscow ship Iran around 140 tons of raw uranium in exchange for Tehran’s low-enriched uranium, and Ali Akbar Salehi, who heads Iran’s atomic energy organization, recently said that his country already received the uranium ore. In return for Tehran’s acceptance of more than a decade of constraints on programs that could be used to make nuclear arms, most international sanctions imposed over its nuclear programs will be lifted. Iran will have access to about $100 billion previously frozen assets and fully return to the oil market. 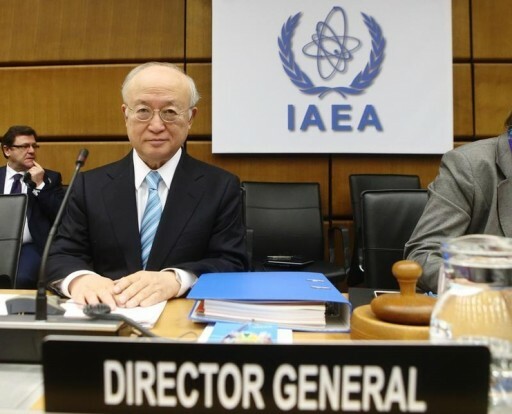 That will happen after the IAEA confirms that Iran has met all commitments. That stage of the Iran-six power deal, known as implementation day, is expected sometime next month. its called overstock.. Iran still have the original l stock, KERRY dont try to convice the stupid . they are not to be trusted in anyway.